A crucial part of ongoing efforts to promote higher education in the areas of computing and mathematics, Compunetix is once again proud to sponsor the 2018 version of the Three Minute Thesis competition at the University of Pittsburgh’s School of Computing and Information. 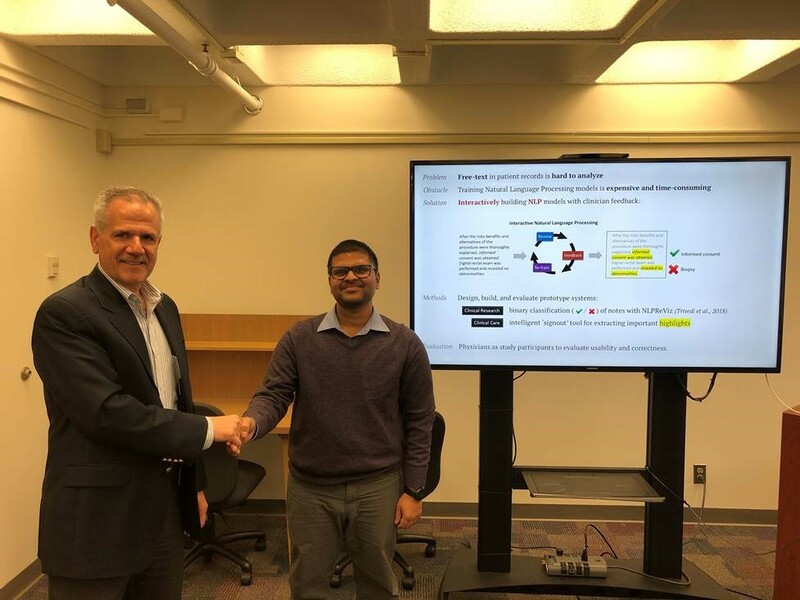 This annual Pitt competition, formerly referred to as the Graduate Student Research Award Thesis and hosted by the university’s Department of Computer Sciences, was reorganized this year to match the launch of the new School of Computing and Information. The contest is now part of the larger, multi-national Three Minute Thesis (3MT®) competition umbrella organization. This international contest was developed in 2008 by the University of Queensland and now involves students from leading universities across the globe. For the competition, PhD students are given a short period to present a compelling oration of their thesis and its significance. The format challenges students to consolidate their ideas and research so that they can be presented concisely. Compunetix Senior VP Mr. Gerard Pompa, himself a graduate of the University of Pittsburgh in Computer Science, was on hand Wednesday, April 4, to present awards to the winning submissions. Winners of the School’s contest will go on to compete at the University level, where selected winners from the University may go on to compete internationally. The winner of this year’s competition, Gurav Trivedi, with Compunetix Senior Vice-President Gerard Pompa. Each student was asked to generate a vibrant ‘poster’ to help communicate their ideas to the judging panel. This ‘poster’ is most often presented as a single powerpoint slide. The students are then provided three minutes to present their research, data and any conclusions in spoken word. The material and presenters are then adjudicated by the panel across two main areas: Comprehension & Content, and Engagement & Communication. The 2018 version of the School contest was judged by a three-person panel made up of Kayla Booth, Assistant Director, I3 Program, Visiting Assistant Professor; Wes Lipschultz, Director of Student Services; and Kelly Shaffer, Program Manager. As the winning presenter, Mr. Trivedi was presented with a cash award by Compunetix and will go on to compete against student winners from other Pitt schools and then internationally.